In today's world we all know how important it is to teach our children respect for our environment and each other. 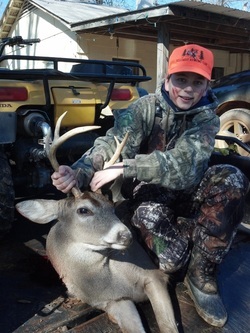 Hillcrest Hunting Club is proud to encourage our youngsters to be involved in the outdoors. 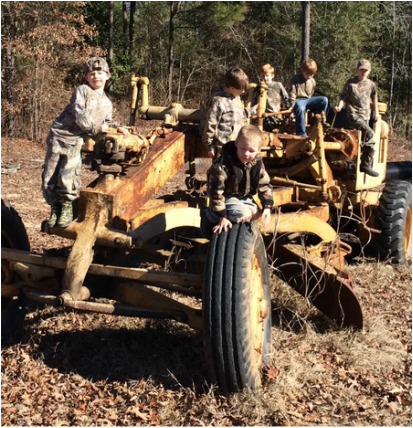 Each year during Alabama's state wide youth hunt, we strive to have all of our little members present and on the trail of a trophy. Feel free to browse through some of our proudest moments. Do you remember the first time you went hunting? Do you remember the first deer you took? Sure you do. Your heart pounded, your hands shook; all of the instructions and practice raced through your head: "Take a deep breath, get a good aim, hold the gun firm against your shoulder and squeeze the trigger." That 'Buck Fever' feeling, what a rush! Now you can re-live the excitement through the hunter's own words. Levi Ellis - First blood! 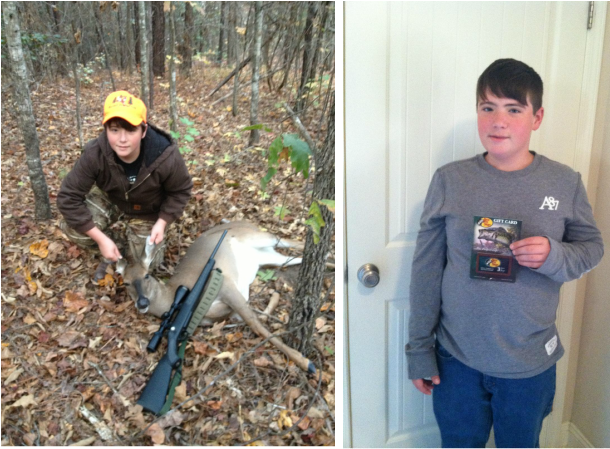 Levi has been hunting with us for the last 5 years, since he was three! 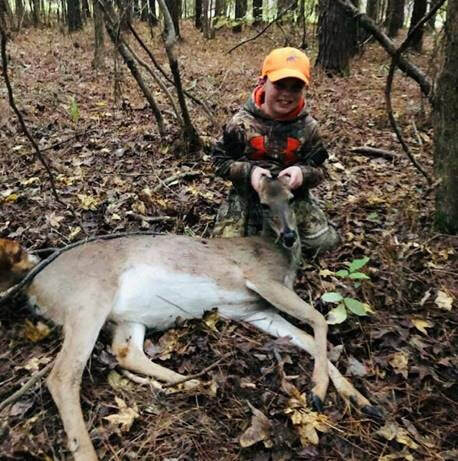 We are so very happy to see him get his first deer. Hudson Smith - First blood ever! This is Hudson's first year in our club, we all are very proud of him and look to see him get many more! for sponsoring a $100 gift card to Bass Pro Shop for the biggest deer! 2014 - 2015 First Blood! 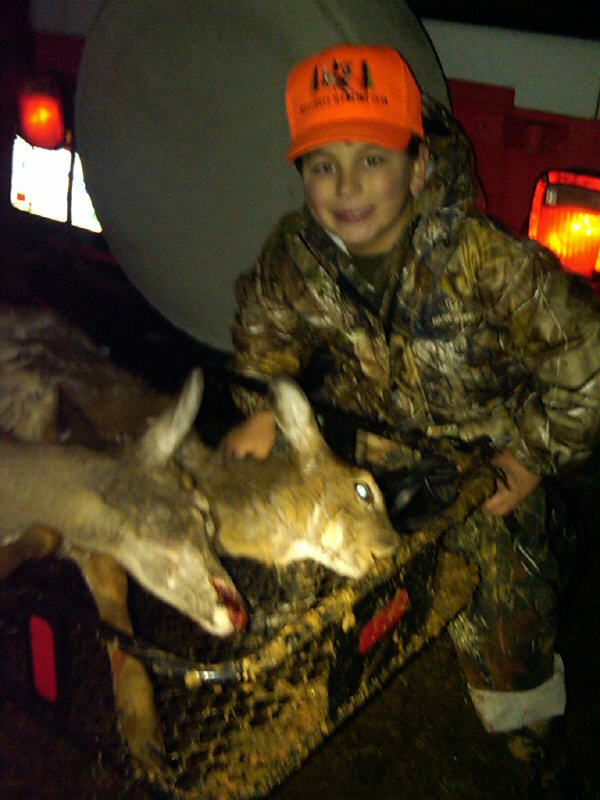 Caden, my 6 year old son, got his 1st deer on HC 14 yesterday. It was an awesome father son experience! +/- 150 yards and his first time pulling a live trigger on his .243. A special thanks goes out to Claude and his grandson Sam for helping us retrieve the deer and to Bradley for helping us clean it! Everyone has been so good to us. We are so proud to part of the Hillcrest Family! It all started after my first year of hunting when I got my first deer, a doe. I wanted to get a BUCK! I let countless spikes and even more does graze to try to lure in the bucks. Nothing seemed to work for me – NOTHING! On the weekend of January 18-20, 2013, I was feeling lucky. Sort of like you would feel after “wishing upon a shooting star”. After hunting Field 4 Friday afternoon and Saturday morning, I was starting to want a change of scenery. We hunted a different field Saturday evening. But something kept telling me to go back to Field 4. So Sunday morning I went back. At 8:51 am, a split tipped spike walked out. Even though this was my last hunt for the season, I was still not tempted to shoot the 4 pointer. It was not what I wanted. I wanted my first buck to be something to be proud of. So I waited. My Dad said that deer would be our decoy. Then, at around 9:15, I heard leaves crunching and footsteps in the woods. I put my scope up and looked around scanning the tree line. Then I spotted IT! There it was. A few feet in the woods stood a large 8 point buck!!!! I was so excited that I wanted to scream, but I didn’t. trigger. But I was still so excited that I totally missed my target. Then I relaxed a little more, took aim and squeezed the trigger again. The buck went down, but the hit was high on his back. I reloaded and shot and nailed his neck. That was it. He was mine!!!! This time I screamed out loud “HALLELUJAH”! I mean I really screamed it! I then thanked God for this wonderful moment. Then I went running across the field through two feet of water to get to my buck. My 2 ½ year quest was over! My Dad and I loaded my buck and drove it to the processor where it was turned into lots of tasty deer meat and most exciting, my first full shoulder mount!!!! My Dad finally took me deer hunting for the first time this November. 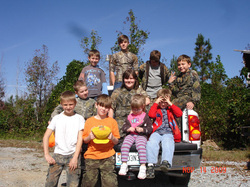 It was the Youth Hunt Weekend. On Friday, we drove down to his new hunting club. I was getting more and more excited the closer we got. We finally got to the club, and since it was late, Dad said that we should go to Field #5 (which meant absolutely nothing to me). We got in the house and began our lookout. In a little while, we saw 3 deer on the field down from ours. They were eating in the field for a long time. I finally said that I wanted to shoot one, but Dad said that he was proud of my confidence, but he wasn’t going to let me shoot deer that were over 350 yards away. We waited until dark, but nothing came to our field. The next morning Dad got me up really early, but I didn’t mind. We went to a different field. We did not see any deer. But I liked the place so I told Dad that I wanted to hunt there in the afternoon. We were there about 2 ½ hours when Dad said “DEER!! !” I looked up and saw the deer. I followed what Dad said and carefully and slowly raised my gun and took aim. 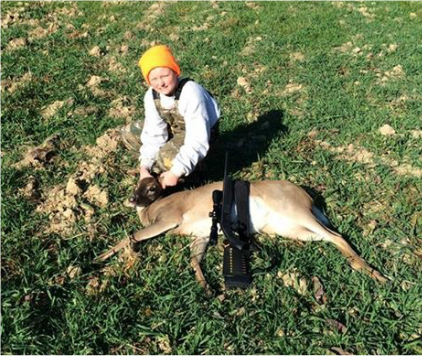 When the deer turned sideways, Dad said “hold your breath and squeeze the trigger”. I did!!! The deer ran in our direction and ran to the steps of the shooting house. I couldn’t see it from my side and asked if I got it. Dad looked out his side window and said“you sure did!” Boy was I excited. We went down at look at it. We moved it from the field. I asked if we could keep hunting, and Dad said yep! A little while later Dad saw a big doe cross a fire trail. Soon I saw it in the field. I got my gun up but rushed the shot and missed it. 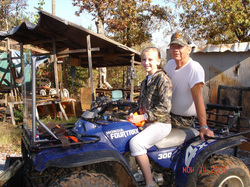 But I got my first deer that day so Dad put some blood on my face and took pictures to send to Mom. She was all excited as well. We loaded up the deer and headed back to the camp. Boy was this an exciting day. I couldn’t wait to go hunting again. I see now why Dad loves to hunt. It is awesome!!! !